The vaccine is available in plastic vials of 100 ml for 50 doses. least 21 days before the Hemorrhagic Septicemia season). 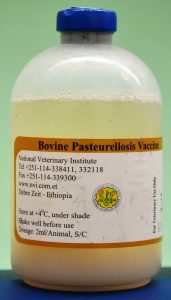 – Cattle (including calves) – inject 2 ml subcutaneously on the neck area. Revaccination is advisable after 6 months. Anaphylactic (shock – allergy) reactions may appear occasionally after several vaccination. In case of such reaction administer anti – histamin drugs immediately. Vaccinate apparently healthy animals only.